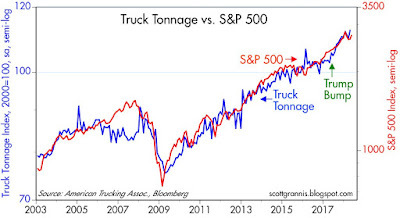 For years I've had a number of posts linking Truck Tonnage to equity prices, and they've all been impressive—in the sense that the physical volume of trucking activity has had a strong tendency to track equity prices. I can't say which leads which, but when they move together they appear to be self-validating. 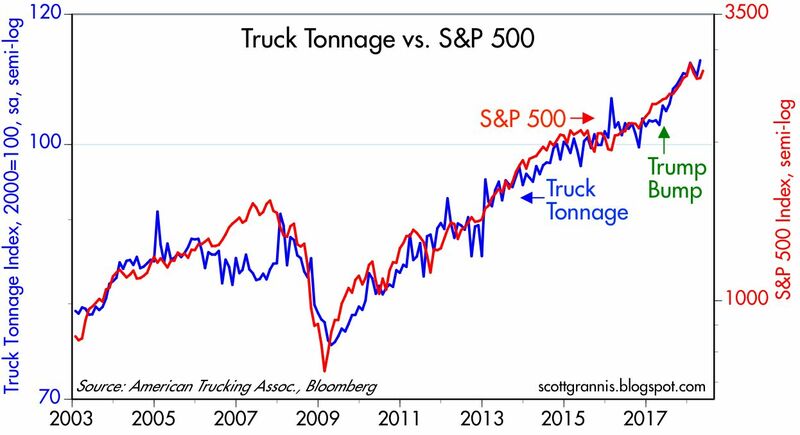 As Chart #1 shows, truck tonnage has surged 9.5% in the year ending April '18, and the S&P 500 Index is up almost 14% over the same period. Both have experienced substantial growth since Trump's election, in what might be called a "Trump Bump." This further suggests that the economy's growth rate is picking up. which is compiled and released weekly. ... 5,443,730 intermodal units, up 5.9 percent from last year." (the "may-19" will be "may 26" in the URL next week. Obama: Up at +2.2% average after "Bush" recession ended. Trump: Up at +2.3% rate in 1Q 2018 (first estimate). but +2.3% under Trump is an economic boom? not a leading indicator of economic growth. our very low birth rate. Please don't cheerlead for Trump. rather than for good intentions and expectations. accomplished that requires Congressional approval. Americans who watch the news! Re GDP growth: GDP growth in the year ending last March (the first quarter of last year was Obama's achievement, not Trump's) was 2.9%. if growth in the current quarter meets expectations (3.5% annualized, based on the average of the Atlanta and NY Fed's estimates), then the annualized growth rate of the economy since the end of Q1/17 will be 3.0%. I'm not declaring victory yet for Trump, but things seem to be moving in the right direction. pro-business attitude (especially versus Shrillary). especially when the first quarter was weak ! The future economy is always speculation. was over 5% real GDP annual growth rate.! and usually is by the end of the quarter. This happens almost every quarter with GDP NOW. so as not to annoy you, and we will see what happened. in my investment portfolios for this year. My biggest concern is a trade war with China. on any auto imports from China. Why just truck tonnage? Why not all transportation tonnage? Why not all GDP? This is so dumb i like it. Scott, how is the chemical activity barometer fairing, is it showing a similar bump pattern? I cannot find the symbol listed if it is an index. Thanks! Like Scott Grannis, I think the corporate income tax cut will boost real growth, and may not hurt tax revenue that much. (There is an issue of reported income switching from personal to corporate, driving a loss of revenue for that reason as well, but set that aside). Scott Grannis is expecting real growth possibly higher than the 2% drudge we have been in. I want that too. The US Fed declares the long-run sustainable real growth rate of the US economy is…1.8%. The central bank also says the long-term sustainable minimum unemployment rate is 4.7%. The greatest threat to our prosperity is the Rocket Man…or the Fed? A cynic might say that Chair Powell does not want GOP-Trump and corporate tax cuts to end in recession, so he will loosen up through 2020…. DC is a booby-farm these days, so who knows?